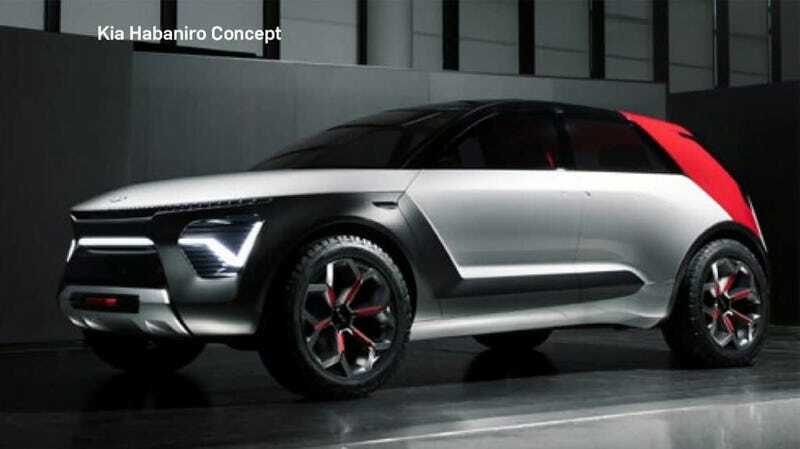 The Kia Habaniro will debut in New York next month, but an image of it appeared in a newsletter ahead of the New York International Auto Show, seemingly accidentally. It looks slick as hell. Habaniro, get it? Like “habanero,” the peppers, and Niro, the baby crossover thing. CarScoops got the, uh, scoop. The Habaniro is one of more than a few Kia concepts the company has been rolling out in recent months, as the company ramps up its electrification efforts. Indeed, the Habaniro’s own name hints it’ll be probably be some kind of hybrid or even fully-electric motor, like the existing Niro. But, you know, much, much hotter. On the outside, one of the more interesting features is the lack of side mirrors, suggesting it’ll have cameras instead. The door handles also appear flat, while wheels seem satisfyingly oversized. Overall, I like it, and hope to see it in person next week at the show. Crossovers would be a whole lot more appealing if they all came extremely hot out of the gate. Does Kia have the guts to actually put this thing in production? We’ll see, but Kia’s strategy as of late has been to throw everything and see what sticks. I emailed a Kia spokesperson and will update this post if they respond.